This post is part of Researchly’s weekly Blockchain and Crypto report covering ICOs, dapps, and news sentiment. You can read the full dapp report here and the full news report here. 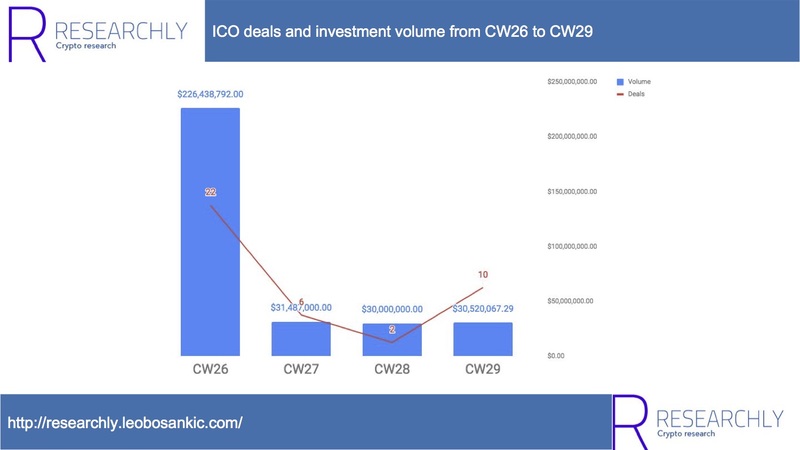 This post analyses ICO trends for CW29 (15.07.2018 – 21.07.2018). Data marketplaces fighting incumbents: Beat and Fysical, both data marketplaces, stand for the growing interest in blockchain-based data marketplaces. Contrasting them to incumbent non-blockchain data marketplaces I examine how they might succeed against established competitors. Cryptos becoming banks: With European Crypto Bank, a bank, I am shortly contrasting different strategies crypto startups follow to become banks. Guidelines for blockchain oracles: Finally, with Kleros I am examining a few guidelines for blockchain oracles. 10 ICOs finished last week and raised around $31 Mio. Based on volume this is similar to the last three weeks but lower than CW26 with $230 Mio. However, if we discount the EOS $200 Mio. ICO from CW26, the figures become more comparable. Based on deals it was more than the previous weeks, except for CW26 where we had 22 deals. Last week, two data marketplaces finished their ICOs; Beat and Fysical. Beat is a data marketplace for health and sports data and raised around $3 Mio. Fysical, one of Streamr’s partners (see below), raised around $3.4 Mio (PRE-ICO). Fysical is a data marketplace for location services where entities (e.g. apps, machines, or consumers) can submit and buy location data. At the same time a similar company, FOAM, a Proof of Location protocol for open source maps and verifiable/tamper-proof geospatial data has started their token sale on Token Foundry. Data marketplaces are a common area for blockchain startups and a range of them already exists. Some like Streamr have been around for quite some time (Streamr raised $27.000.000 Mio. in their ICO in 2017). One use case for data marketplaces is decentralized machine learning for autonomous cars. However, non-blockchain based data marketplaces are similarly not new and they have existed even longer, including ones by big corporations like Amazon with their Open Data. It would be naive to assume that these companies would not transit to blockchain-based versions if they suit them. As such, it should not come as a surprise that, for instance, Amazon has registered a patent for a data marketplace for cryptocurrency transaction data. This established competition raises the question for the future of blockchain-based data marketplaces. First, it is important to keep in mind that “experimenting with blockchain” involves more than tech. As I have written in Decentralized applications – “experimenting with blockchain” is more than tech this includes competitive fights (with startups and incumbents), user education, and developing the auxiliary building blocks such as blockchain governance or token-curated registries, among other things. Secondly, the incumbents’ reactions are crucial. Here we have two considerations. First, customer base. Incumbents might lack the innovation (i.e. blockchains), but have the customers. Startups have the innovation but lack the customers. Whether blockchain startups like Streamr will get the customers before the incumbents get the innovation is the million-dollar question. Also, and this is what might prevent startups from getting the customers before incumbents get the innovation, there are all these ICO investors. Sure enough, ICOs have provided great financing but I think it is often overlooked that these investors must be managed. Such shareholder-management costs time and brings many risks (e.g. arbitrary FUD). Finally, it is essential that blockchain-based data marketplaces prioritize their product roadmap. Many incorporate all the bells and whistles blockchains offers (governance models, stablecoins, token-curated registries…). However, I believe that down the line they will realize that they can only scale if they innovate incrementally because else they are spreading them too thin. Another project I want to highlight is European Crypto Bank. As the name suggests it is a bank and trading platform “to secure investments on cryptocurrencies market (Bitcoin, Litecoin, Ethereum, Ripple, Dash,…) on the blockchain” (unsure what that means). They have raised around $8 Mio. I am generally skeptical about startup banks, especially those doing an ICO. The European Crypto Bank is no exception. Nevertheless, it is interesting to view their ICO in the context of recent news. It shows namely that the ICO/blockchain world and banks are coming more and more together. The two most noteworthy examples are Litecoin and Binance. Litecoin recently acquired a 9.9% of German WEG Bank and Binance announced a $155 million investment into Founders Bank. With this in mind, the question is what the future of banks will be regarding consumer-facing offerings. Firstly, startup banks (centralized or not) will have an extremely hard time. Not only have several non-blockchain challenger banks failed against incumbents, but banks are also, such as Commerzbank, exploring Blockchain technology, innovating outside the blockchain industry and could thus slow down the adoption of Blockchains. Besides that, as mentioned above, “blockchain” demands far more than “just” code and technological know-how. With this in mind, I believe that Litecoin’s strategy to invest in an existing bank will be the more fruitful approach in the short-term. Several other blockchain oracles already exist. By the way, one of them – Augur – went live last week and was one of the most popular dapps last week but also this week. Kleros puts an interesting spin on oracles by narrowing them down to disputes (even though the voters are not necessarily real lawyers). In last week’s report, I argued that “Although blockchain oracles could be a solution here I am unsure whether this would justify the overhead.” In the case of Kleros, this means that although decentralized settlements could be fairer than central judges, in many cases they won’t justify the overhead.